Halibut Point State Park’s July 2010 programming schedule is jam-packed, beginning with a large number of goings-on over the long July 4th holiday weekend. On Friday, July 2nd at 10:00am the park is offering Tidepools, a trip down to the rocky shore for some inter-tidal exploration. On Saturday, July 3rd at 10:00am and on every Saturday in July at the same time Halibut Point is offering its Quarry Tour, entailing a video showing of The Uncut Block, a stone-splitting demonstration, tour of the former Babson Farm Quarry, a presentation on the history of quarrying on Cape Ann and some surprising information about the region’s unique geology. On Sunday, July 4th at 11:00am there will be another Tidepools program (other Tidepools in July are Friday, July 16th at 10:00am and Sunday, July 18th at 11:00am) and at 3:00pm on July 4th (and repeated on Sunday, July 18th at the same time) there will be a presentation of The Military History of Halibut Point, featuring two centuries of the park’s military history along with a climb to the top of Halibut Point’s World War Two artillery fire control tower. To complete the long holiday weekend of programming, on Monday July 5th from 1-4:00pm Halibut Point is offering The Atlantic Path, a trek along Rockport’s resplendent public coastline. This very popular event comes with a number of factors to keep in mind – this is not a “path” per se, but in many cases calls for negotiating some challenging terrain including jagged, protruding boulders. Also, wearing shorts is discouraged; there are areas of poison ivy, thorny bramble and areas of biting nasties. For those who can handle a trek with extreme elements, the rewards are wonderful – geological features like no place else on Cape Ann or even in New England, fabulous tidepools, seldom visited coastal stretches and more. But there’s still a lot more going on at Halibut point in July: on Saturday, July 17th at 2:00 the park will host the extraordinary images of photographer Leslie D. Bartlett and his program Halibut Point in Winter. On Sunday, July 18th at 8:00am the monthly Birding for Beginners with Peter Van Demark will meet in the parking lot. There will be another Sunday Sounds concert on July 25th at 3:00pm sponsored by the Friends of Halibut Point State Park featuring the classic oldies but goodies of Midlife Crisis. And on Saturday, July 31st at 5:00pm Halibut Point will host the first of two productions from the Rebel Shakespeare Company – Othello, staged outside overlooking the former Babson Farm Quarry. Yes, Halibut Point and the Rebel Shakespeare Company once again are collaborating on bringing Shakespeare in the park! Don’t forget – all programs and events at Halibut Point State Park are brought to you by the Massachusetts Department of Conservation and Recreation and are FREE. 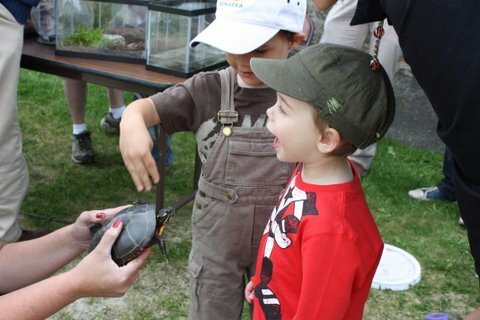 If you would like to download a flyer with Halibut Point’s July 2010 schedule of programs and events, just click here.